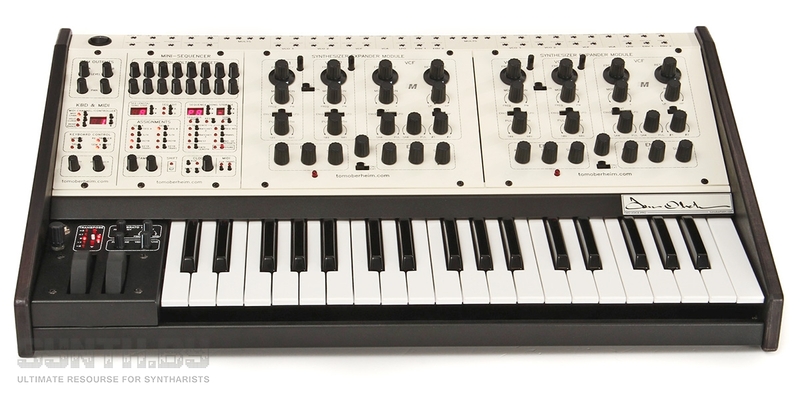 Two Voice Pro is a revived model of Oberheim’s Two Voice synthesizer (released in 1975). 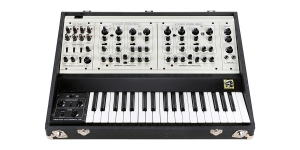 The architecture of the instrument is based on Oberheim’s famous SEM designs with their unique oscillators and filters which became the basis of Tom’s instruments including 4 Voice and 8 Voice instruments. The 3-octave velocity sensitive Fatar keyboard with aftertouch features added weight under the keys and offers 7 velocity curves. The front panel features some changes from the Two Voice original model which concern the left part of the control surface and is about the Bendbox and its rubberized mod wheel capable of being sent to other destinations and a pitch wheel. The Bendbox also features a dedicated vibrato LFO with the possibility of amount and frequency dial which allows other two LFOs of a SEM get busy with other functions. Four VCOs of the two SEMs have a global pitch tuning control. Both VCO2s of the SEMs can be detuned simultaneously and individually. The Keyboard Control section allows for versatile operating of both SEMs. You can control them in a unison mode or make the envelopes trigger with each note pressed. Both SEMs can be assigned to different notes in a chord. The application of SEMs is multimode because here you have a Rotate option, a “SEM A First” option with the first note trigerring SEM A and all subsequent – SEM B, and a Split option. The enhanced SEMs sound familiar in a most heartwarming way though apply a surface mount technology instead of a through-hole relic. The sonic flow is smashing and the quality is stunning. A sine wave LFO can get routed to both VCOs and a filter of each SEM. Oscillators generate saw and variable pulse. With the classic 2-pole SEM state variable filter design can set the sound rocket-high keeping the lows convincingly audible because the Two Voice Pro filter doesn’t self-oscillate. The filter section allows for achieving smooth transitions between low-pass, high-pass and notch modes and having all the kinds of sonic experience from noble hissing to liquory blossoming. Punchy and dynamic ADS envelopes (filter and amp dedicated) are applicable for compressed-like drums, spirited basses and some amuzing effects. 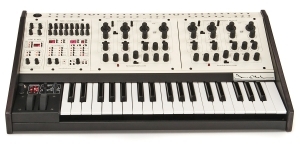 The connectivity range gives you a necessary set of MIDI control support, independent outs, and CV/Gate means of interaction. Two Voice Pro lacks patch memory though probably for a good reason – it’s so musically unlimited it was meant for improvising. 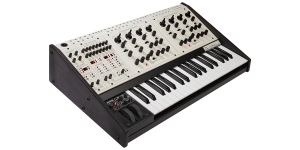 It’s no surprise many most excitingly sounding synthesizers offering tons of voice shaping possibilities featured no patch memory.